A man allegedly axed his mother to death, drank her blood and then dismembered the body parts in Korba district of Chhattisgarh. Korba: A man allegedly axed his mother to death, drank her blood and then dismembered the body parts in Korba district of Chhattisgarh. During investigation, the police recovered a book on black magic from the house which further strengthens the belief that it is a suspected case of sorcery. The incident took place on December 31 in Ramakachhar village under Pali police station area. The police were informed about the same by villagers on January 3. On being informed of the incident, a police team rushed to the spot and found a book on black magic and the axe in the blood-stained house, Sub Divisional Officer of Police (Katghora area) Sandip Mittal was quoted as saying in a PTI report on Saturday. The accused has been identified as 25-year-old Dilip Yadav. He attacked his mother, Sumariya, with an axe, killing her instantly. Later, he drank her blood and dismembered the body. Reportedly, he also performed some rituals and offered the deceased’s body parts at a religious place inside the house. He even incinerated the body in an earthen ‘chulha’, Mittal informed while claiming that the exact cause of death would be ascertained once police teams manage to nab the accused. In a similar incident, which was reported from Ranchi district in Jharkhand in December last year, a man allegedly killed his mother-in-law and ‘drank her blood’ in a bid to achieve supremacy in witchcraft. The accused was arrested from a village in the district. 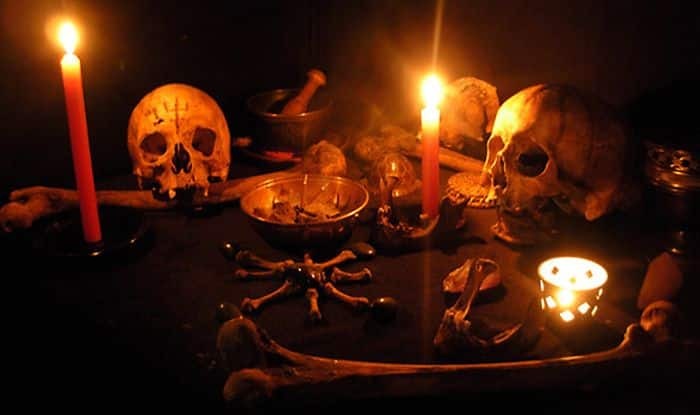 Identified as Fhalindra Lohra, the 30-year-old accused, confessed to practising witchcraft and committing the heinous crime, to obtain greater powers. The crime was reported from Rangamati village under Silli police station limits. The cops were informed about the incident by Sakuri Devi’s husband.